For those of you who don't have your eyes glued to tech news, last week was Computex. That's the technology show which takes place in Taipei, Taiwan every year and is usually dominated by new graphics cards, processors (including a Qualcomm one for wearables) and the PCs that those next gen chips and components will be nestling inside. This year, VR made its presence felt, which is perhaps no real surprise now that the Oculus Rift and the HTC Vive are a little easier to get hold of. Watching the show from afar, there were two demos that really stood out for me. The first was Cooler Master's VR parachuting experience and the other was Holodia's VR rowing machine rig. With a HTC Vive hooked up to a PC and the user perched up on a Concept 2 rowing machine, Holodia's rig was able to transport you to far more exotic locations to work out in. For years, companies have tried their best to break the monotony of sitting on a stationary bike or treadmill as you stare at yourself in the mirror, or desperately try to avoid making eye contact with neighbouring calorie haters. 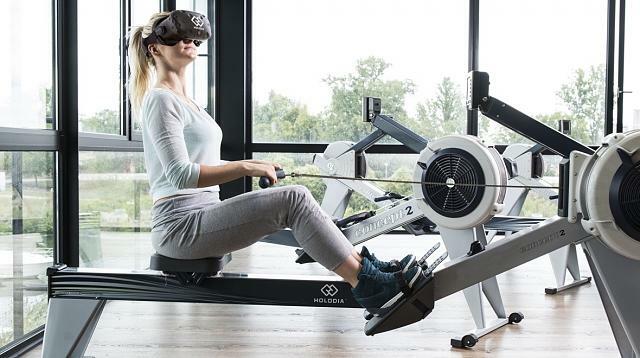 We have seen countless simulators and virtual trainers, but with VR it really feels that this is the solution to bring us out of that exercise slump. My first experience of bridging VR and exercise was with the Virtuix Omni VR treadmill a couple of years ago. It was a setup in which I stood on a small circular treadmill, holding a plastic gun and transported into an FPS battlefield. Everything about it felt awkward, unnatural and personally didn't feel right. Setups like the one from Holodia, or the VirZoom VR exercise bike controller or the frankly ridiculous looking Icaros flying simulator (pictured above) makes a little more sense. They feel like the natural progression from simulators that struggle to capture the idea of taking you from your mundane location and putting you into another one. But there's some pretty big problems here. Wander onto Holodia's website for its nearly 10,000 VR rig and you'd think they'd magically managed to solve one of VR's biggest problems; the cables. Holodia's solution is to raise the cables up above, which I'm sure will work for those who have the capability to and space to assemble it that way. But, together with the price, that's a very small customer base. Then there's that headset. Selfie tennis on the Vive is the closest I've felt yet to the workout I used to get playing Wii Tennis. And it doesn't take very long for things to start getting hot and sticky under the headset, just waving my arms about to 'serve'. The idea of wearing something that bulky while you're powering through a workout doesn't sound all that appealing to me. We might need to get to LG 360 VR levels of design and form factor, before I really feel comfortable about it. Also, where do you put it? Pricey setups like Holodia will be reserved for those with enough disposable income to upgrade their 'dumb' gym equipment. The future for the rest of will surely lie in gyms. I visited a Virgin Active gym recently where they have dedicated rooms for altitude training. I can envisage a similar solution for VR. I appreciate this is still early days for VR and companies are exploring what is possible with the hardware. The idea of being able to test run a route across the other side of the world without leaving my home or gym definitely appeals. It just might be a while before I try out a system that doesn't make me want to rip off the headsets and harnesses before I've even started. I did not find the today's price of this one, but looks better than the other because it's more realistic in most aspects, but requires the VR Headset and also the bike. Imo, the article author is being just a bit overly critical. Yes, things are still being figured out, but a lot of the "issues" and "problems" that keep being brought up have NEVER been a problem for me and most others I've talked to. I suspect they wanted to write an article and felt it would be unprofessional somehow to be positive about it. Or maybe just feeling that wouldn't draw readers to the article. This is a great news, as for the wire problem, enter the Qualcomm Wireless headset, and probably others to follow of course the processor is Snap Dragon and will not be anywhere near as capable as a Rift or Vive or PS VR but hopefully the processors will get more powerful in the future. I really like the bike training VR feature and would like to try that one day as I haven't done that kind riding in years! The applications for VR and AR are still extremely early days. Myself, I would like to have virtual bike rides and have the bike auto adjust for the terrain. I would also like to do shot put and discus in a similar setup to golf stores' virtual setups. YES! I want a virtual bike set up quite badly! Biking on trails is probably my favourite outdoor activity, but with a growing family and work and everything else, my free time has become quite limited. Getting out to trails barely happens, because if I'm going to make the journey and get all set up, I want to be there for a few hours. This year I've taken my bike out exactly zero times. A virtual bike system would mean I could minimize the prep and drive time and do small workouts that would fit better with my schedule. Even more, I'd be able to bike 12 months of the year, which isn't exactly the case here in my part of Canada! 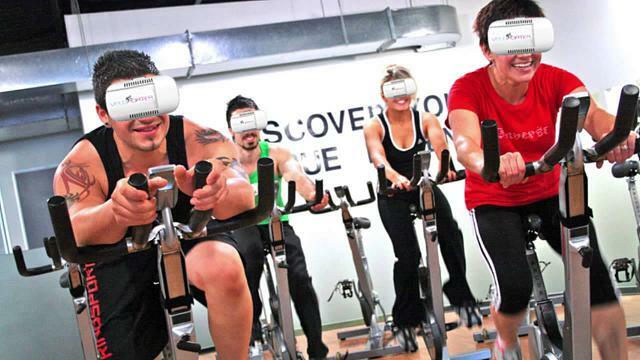 I think one hidden benefit of having a VR is doing two things at the same time, maybe you have the spinning/static bike at home or gym, you are wearing your VR headset or HMD so you are watching a movie while working out, the man problem will be the sweat and the fog in the glasses. But when I was in the treadmill I used to play videos and watch it to distract me even from the running, that way I was able to achieve more. Anybody using any VR fitness Aps?